Planning to store long-term, as well as everyday goods, in your kitchen? Corner pantries provide tons of storage for everything you want to put away. 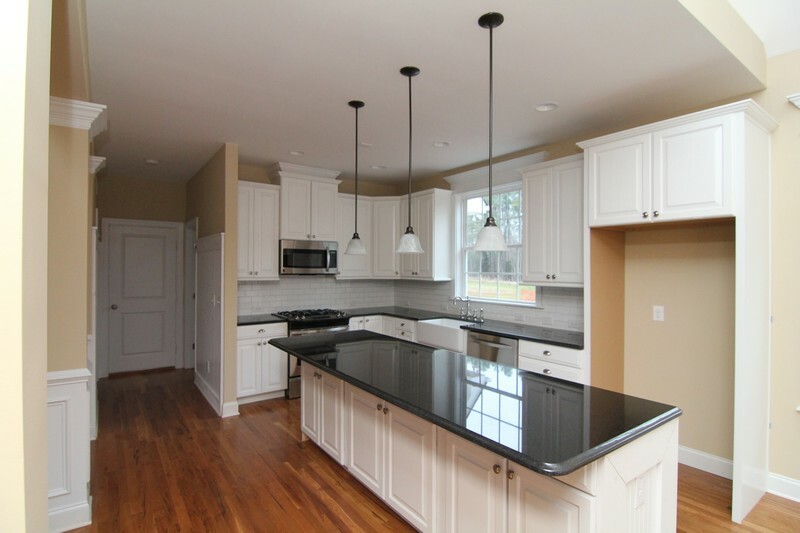 Tell us what your next kitchen needs, and we'll show you what it takes to build a Raleigh custom home. 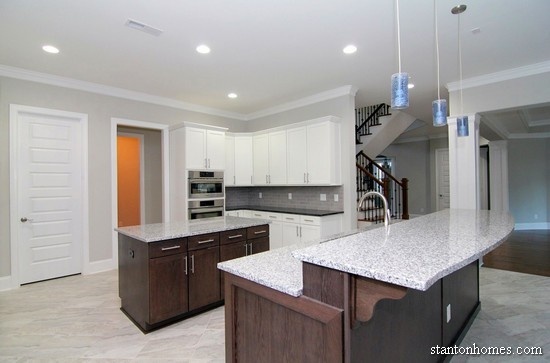 Here are 9 popular floor plan ideas from Raleigh new home builder Stanton Homes. This corner pantry includes a granite counter top - with an electrical outlet above. This space can serve as a great way to store large appliances like coffee makers and mixers - or as an additional cooking space when preparing complex meals or baked goods. 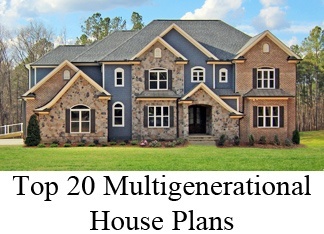 The Serengeti floor plan - a multigenerational design - is Copyright Douglas Janes Architect. Click here to see the full Serengeti Floor Plans and Photo Gallery. 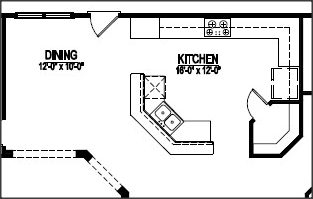 The L-shape pantry layout is most common for a corner pantry - adding significant storage space inside your kitchen. 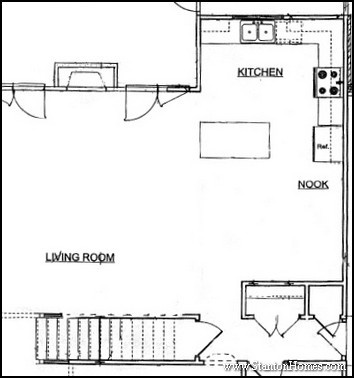 The Blueridge floor plan is Copyright Max Fulbright Design Group and Associates. 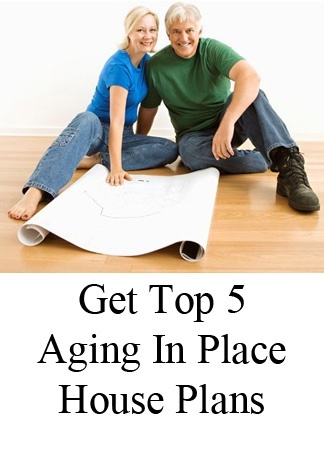 Click here to see the full Blueridge Floor Plans. 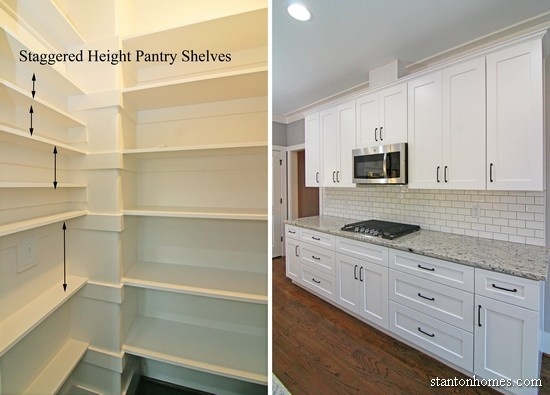 These pantry shelves are designed for mixed-height items, like spice containers and baking supplies. Craftsman style trim wraps around the pantry, for an extra bit of custom design in even the storage spaces of this Raleigh new home. 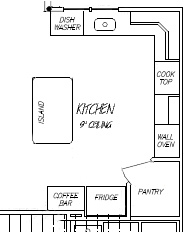 The pantry is set to one side of the kitchen, with an extra "notch" of storage space added to the layout. 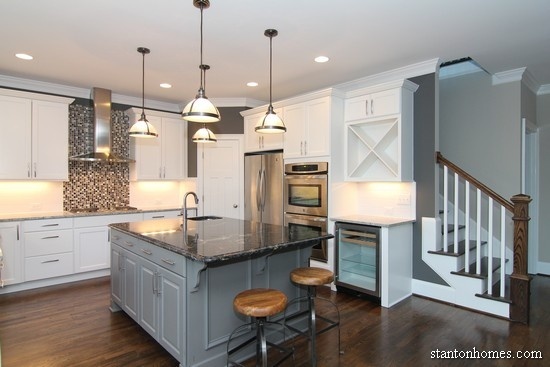 The Mitchells Farmhouse floor plan is Copyright Stanton Homes. Click here to see the full Mitchells Farmhouse Floor Plans and Photo Gallery. 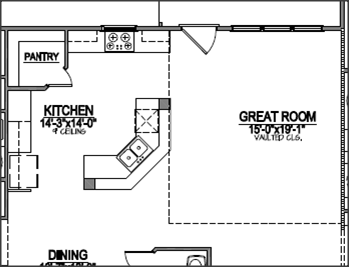 This around-the-corner location allows the pantry to extend for a much deeper layout. And it hides the white pantry door from view, in a kitchen packed with dark cabinetry, white tile, and stainless steel appliances. The Avonstone Manor floor plan is Copyright Garrell Associates, Inc. Click here to see the full Avonstone Manor Floor Plans and Photo Gallery. This corner pantry layout includes an L-shaped interior for tons of storage, with a custom tile floor and glass "Pantry" door. The Blackhawk floor plan is Copyright Stanton Homes. 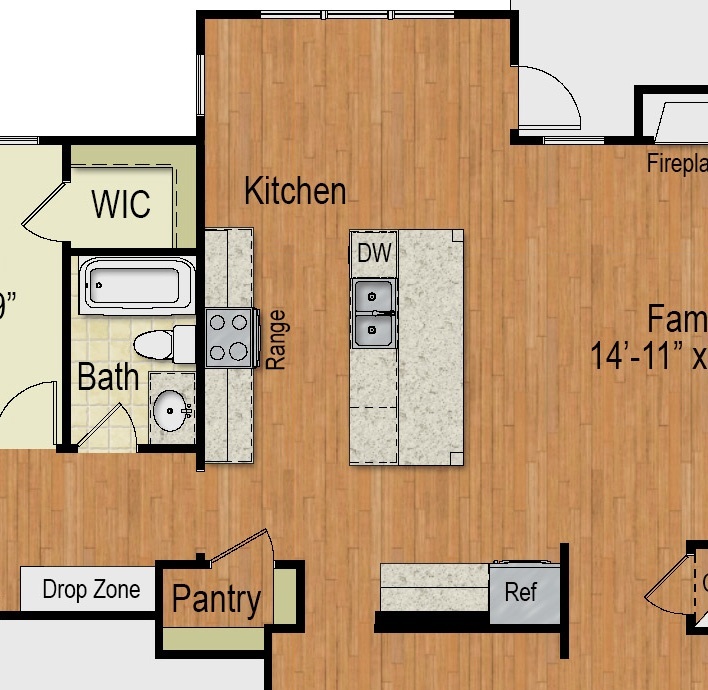 Click here to see the full Blackhawk Floor Plans and Photo Gallery. The location of this "corner pantry" allows it to stretch much deeper than a "standard" floor plan. 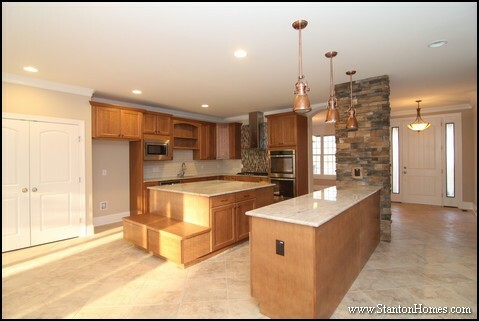 The kitchen has a natural flow and tons of counter space. The pantry is not visible from the front door. The Penelope is Copyright Stanton Homes. 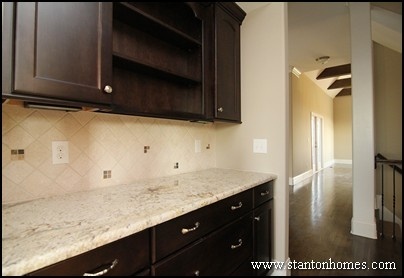 Click here for a photo gallery and full floor plan of "The Penelope". This oversized corner pantry blends easily into the white, black, and gray kitchen design. The Bryson floor plan is Copyright Stanton Homes. 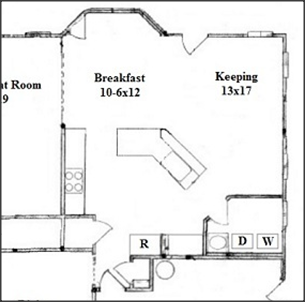 Click here to see the full Bryson Floor Plans. 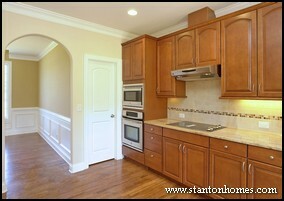 Here is an example of a centered corner pantry in the kitchen. Its central location makes it an integral part of the "work triangle". The Dugan is Copyright Stanton Homes. Cick here for a photo gallery and full floor plan of "The Dugan". In this Raleigh new home, the Breakfast Room and Kitchen were combined to create a massive, entertainment-focused kitchen with island. 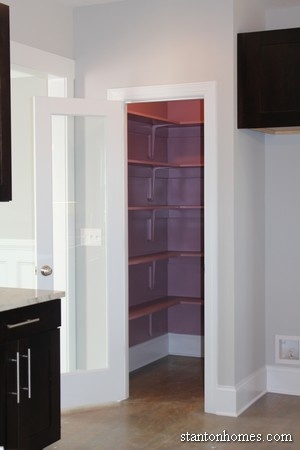 Not all corner pantries are set at an angle: this purple painted pantry is squared off on the front face. See a photo gallery and floor plan of The Worthington here. 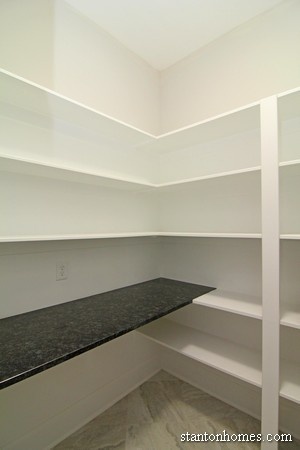 Tell us how much space you need, and we’ll design a corner pantry for your kitchen that fits your lifestyle. Can't find a corner pantry plan you like? Let us know, and we’ll email you more ideas, gathered from tens of thousands of plans to match your specifications. You can also work with our design team to create a brand new plan with everything just the way you want it. 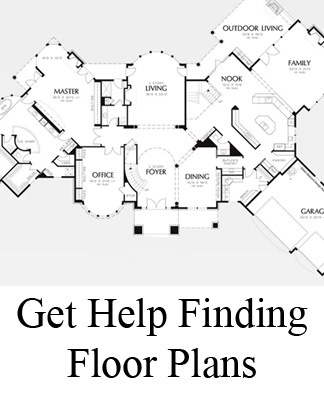 Request more floor plan ideas here. 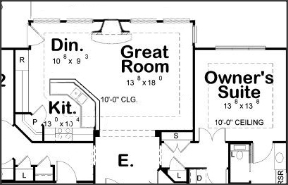 What type of storage is best for my kitchen, a built-in cabinet or walk-in pantry? Pantries provide much-needed food storage in your kitchen. While we're seeing a trend towards integrating cabinetry pantries, many home buyers are still requesting wall and walk-in corner pantries. Your kitchen design should maximize storage space -- in places that make the most sense. See photos of 5 kitchen pantry locations, below. Corner pantries provide a large amount of space without interrupting the flow of an open kitchen. The corner pantry location in this kitchen makes it an integral part of the "work triangle." This double door pantry is wide but not deep -- perfect for those who love linear organization in the kitchen. The pantry is located beside the refrigerator, in a grab-and-go location. Cupboard pantries are designed to blend into your kitchen cabinets. This kitchen features a built-in pantry cabinet beside the refrigerator. Looking ways to supplement your kitchen storage? Consider adding a second pantry. Butler's pantries -- often located between the kitchen and dining room or down a hallway -- are great for storing less-used items such as holiday dishware and accents, formal china, over-sized party trays, and secondary dish and glass sets. There is no pantry built into this small island kitchen. Instead, the pantry is hidden away, around the corner. Don't be afraid to buck the kitchen design trend! Consider placing your pantry in a nearby location, rather than the center of your kitchen. 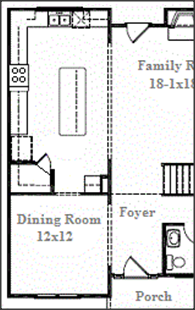 Nearby is usually more convenient, but when the layout requires, the pantry can even be in another room. 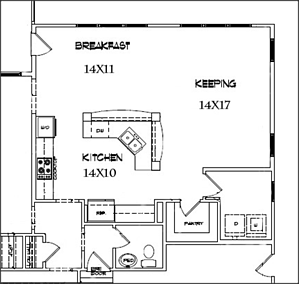 In this California style floor plan, the kitchen pantry is located past the breakfast nook -- between the mud room and garage entrance. 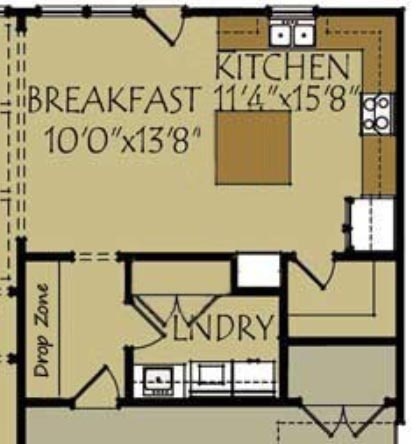 Which should I choose first: appliance layout or pantry location? 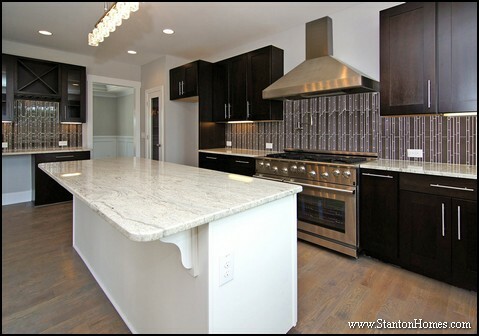 Prioritize kitchen elements that are most important: a large island? Cooking gear, from a 6-burner gas range to double ovens? An open concept layout? 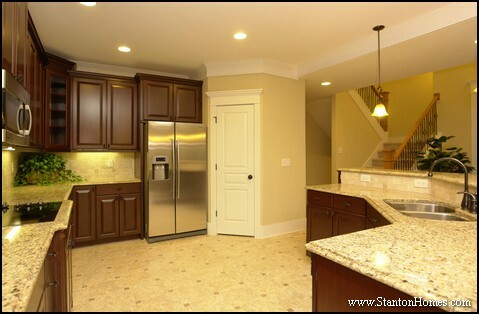 Generally, it is easier to add pantry storage -- rather than cabinets or appliances -- to a kitchen layout you love. 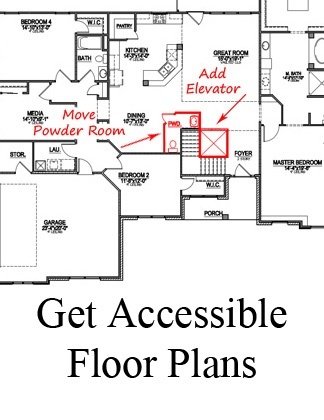 Pantry locations are more flexible, and can fit into hallways, under staircases, or inside dining rooms. 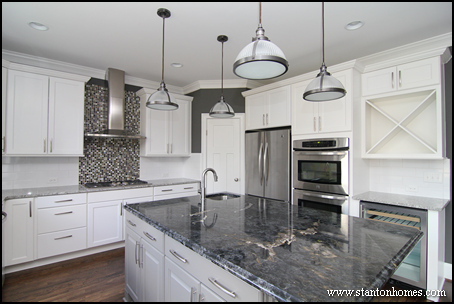 Tell us what kitchen design elements matter most, and we'll help you find and build your new custom home. Just because it's not in a corner doesn't mean it can't offer all the storage you need! 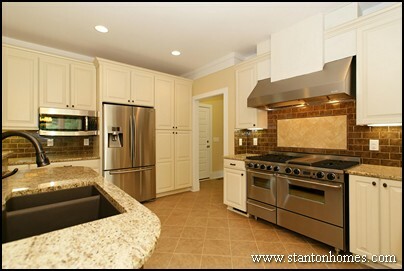 Here are five popular ideas from Raleigh custom home builder Stanton Homes, with video tours and photos. The pantry is within easy reach of the ktichen, but this layout offers seemingly endless counter space within the kitchen itself. Click here for full floor plan of "The Cove". 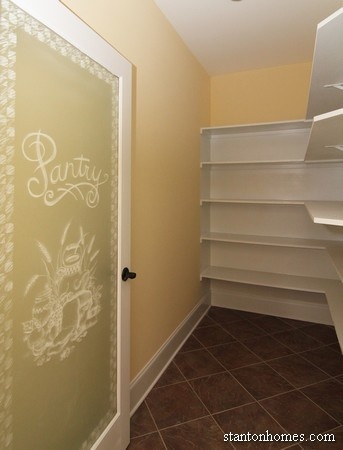 It's all behind the scenes for this huge wall pantry. An oversized walk in pantry is tucked between countertops and the laundry room. 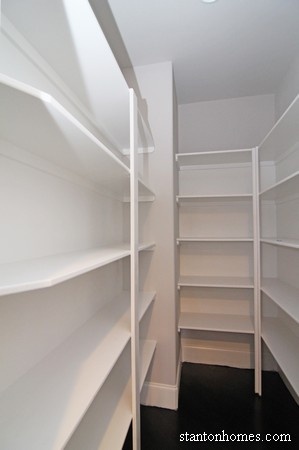 Inside, find wrap around shelving with plenty of room for everything. Click here for video tour of "The Mastrosimone". 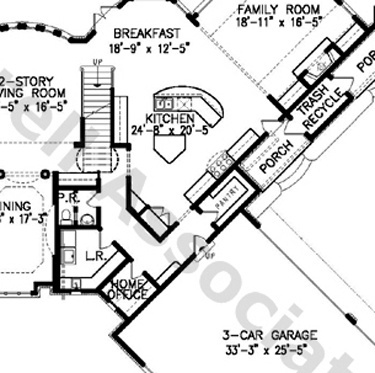 Click here for full floor plan of "The Mastrosimone. This kitchen and pantry layout packs tons of functionality into a budget-impressive room. The "hidden" walk in pantry is located between the Garage and The Dining Room - and offers tremendous storage. The pantry door blends perfectly with the arched opening to the Formal Dining Room. Click here to see how the Linda was custom designed. 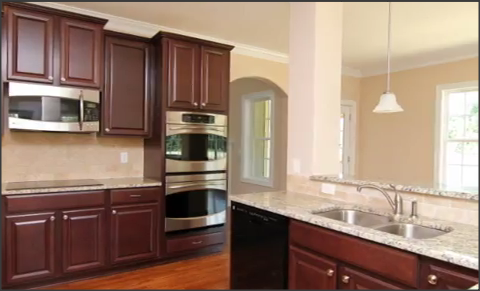 Check out the video tour of "The Lowery" to see how this walk in pantry blends seamlessly. 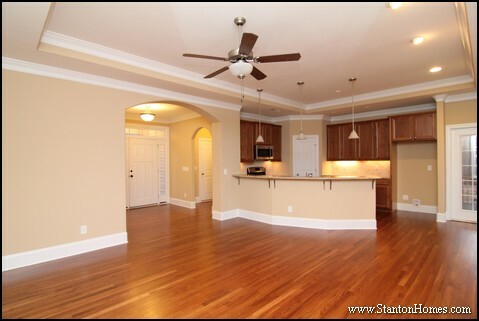 Notice the pantry next to the arched entrance to the Formal Dining Room, and the angled door to the Laundry Room. 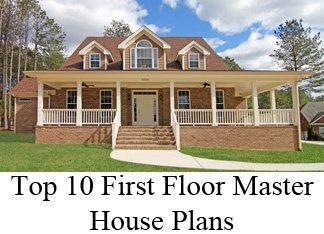 Click here to see the Lowery custom floor plan. See Carwile video tour here. 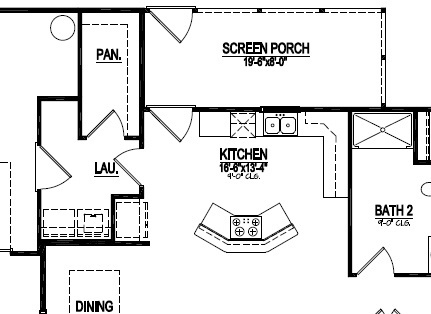 Click here to see Carwile floor plan. 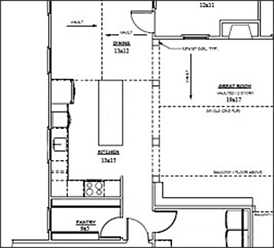 Tell us how much space you need, and we’ll design a walk in pantry for your kitchen that fits your lifestyle. Tuck it in the corner, where there’s lots of space to sort and stack. Corner pantries provide tons of storage for everything you want to put away. 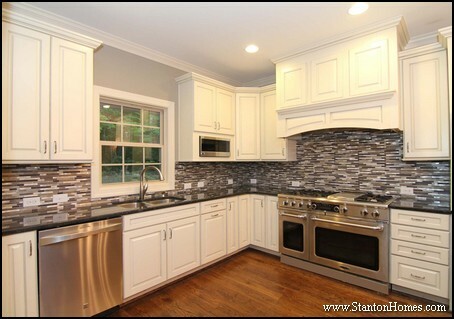 Here are five popular ideas from Raleigh custom home builder Stanton Homes, with video tours and photos. This corner pantry provides a tremendous amount of space without interrupting the flow of an open kitchen. Click here for a photo tour of "The Penelope" Custom Floor Plan. 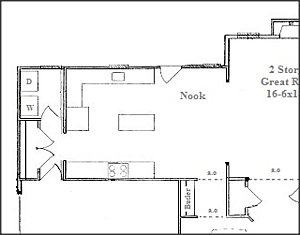 Click here for full floor plan of "The Penelope". A centered corner pantry adds a sense of balance to the kitchen. As seen here, its central location makes it an integral part of the work triangle. Click here for a photo tour of "The Dugan" custom floor plan. The pantry has a place of importance in the symmetrical kitchen. Click here for full floor plan of "The Dugan". This oversized corner pantry lines up nicely with the angled island. With plenty of space for stocking up, the corner pantry is designed for organization. 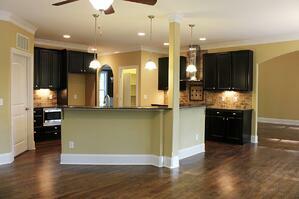 Click here for photo tour of "The Kelley" Custom Floor Plan. The pantry is a great complement to a wall of countertops and tons of upper cabinets for even more storage. Natural light through the window over the sink adds a touch of brightness to this beautiful kitchen. 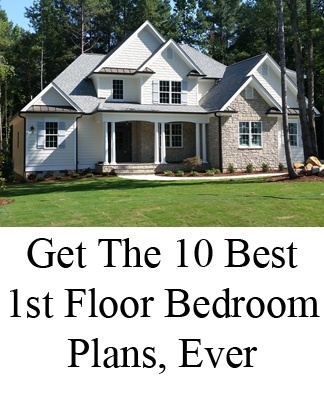 Click here to see the "Kelley" custom home floor plan. 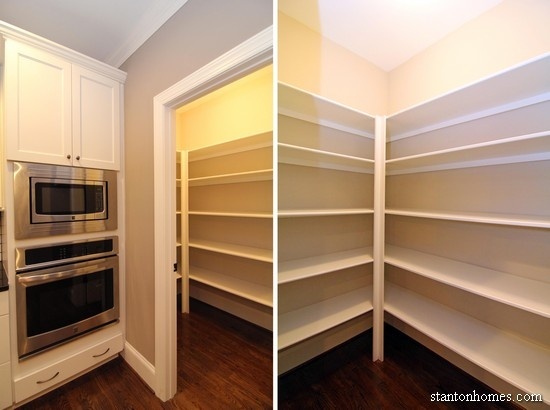 Where space is at a premium, such as in smaller one story homes, corner pantries can offer good storage opportunities. In addition to utilizing interior space, this corner pantry helps create a nice separation of work areas in the kitchen. Click here for video tour of the Sherri, a one story custom home plan. 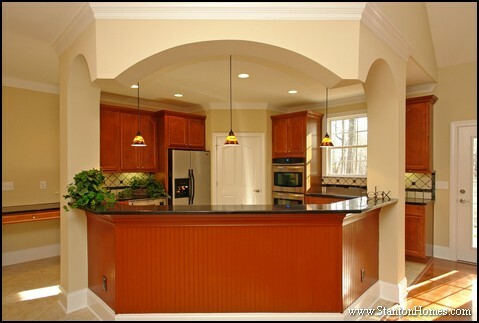 This kitchen is bright and open, inviting interaction with a trey ceiling that extends to the great room. 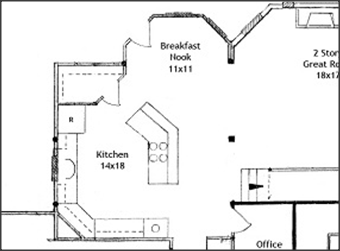 Click here for the Sherri floor plan. 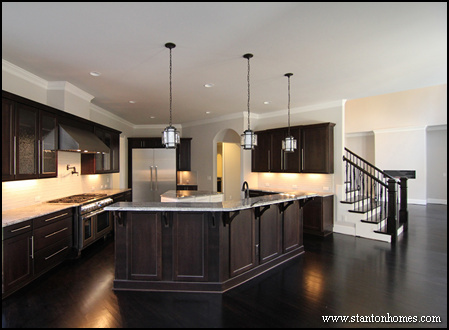 In this custom home, the Breakfast Room and Kitchen were combined to create a massive, entertainment-focused kitchen with island. 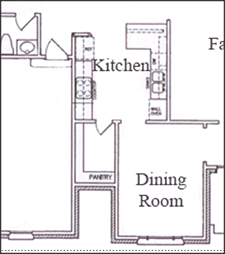 A large corner pantry was added at one end of the room, as a spacious place to store supplies for culinary artistry. 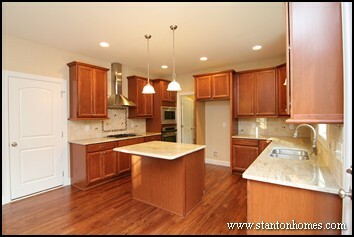 See a photo tour of the Worthington here. The corner pantry can be angled, or squared off as seen here. 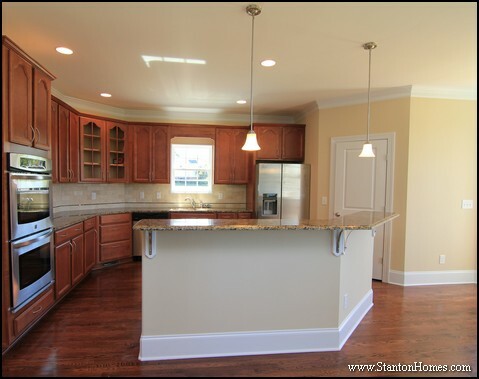 Click here to see the Worthington custom floor plan.